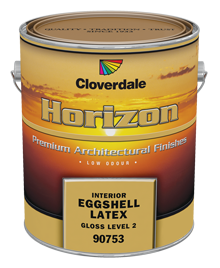 Horizon Interior Eggshell is an ultra-low VOC, low odour paint designed to significantly reduce odour & polluting vapours released into the air which can be harmful or irritating to the user or occupants of the area being painted. This latex emulsion copolymer provides a durable finish suitable for walls in medium traffic areas. Horizon coatings are approved under the GreenWise certification program qualifying them for credit points within the “green building” rating system called LEED (Leadership in Energy and Environmental Design). The aim of the rating system is to improve occupant well being, environmental performance, and economic returns of buildings using established and innovative practices, standards, and technologies. Approved by the Master Painter's Institute under category # 144, Gloss Level 2.